Easy way for a beginner to learn the essentials of creating a successful freshwater aquarium. 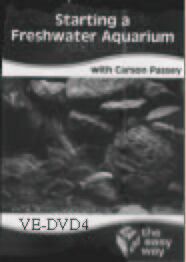 This DVD demonstrates how to create a 55 gallon cichlid tank, a 30 gallon community tank and a variety of small bowls. Viewers will learn how to create and maintain a successful and interesting freshwater aquarium. A must have for hobbyist who are interested in making their bowl more visually appealing and going all out and creating the ultimate cichlid tank.